Well, it was not exactly a revolution but we did it. We rallied in front of the Syrian Embassy on Saturday and we did manage to make some noise. We were about 50 people in all at one time, but some counts around 75 people did show in the three hours period that we spent. The crowed was pretty diverse, and represented Syrians from various backgrounds, ethnic and political. There were also some American and Arab participants who wanted to show their support of our cause. For this, they have our lasting gratitude. 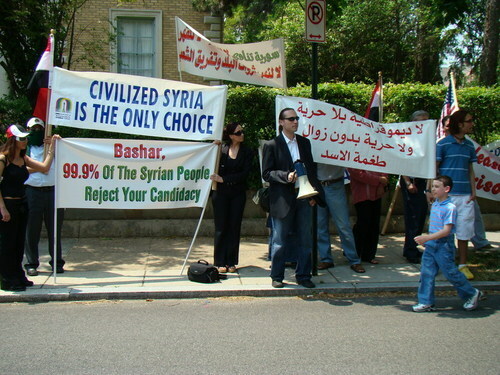 Some photos of the event can be found on the Syrian Elector blog, but the picture above shows the heretical family in action: my daughter, Oula (21), holding the sign on the far left, my wife Khawla holding the sign on the right, I am holding, but not hording I swear, the loudspeaker, and my son, Mouhanad (17), holding the sign on the far right. Much work still lies ahead for this weary soul though. But, in this, I am comforted by the fact that we have a really nice and active team in Syria who are now busy trying to assess the degree to which our call for boycott seems to have had an effect on the thinking of the Syrian people. to be honest I was a little bit disappointed by the count, expecting at least one thousand. I know this is just the beginning, and I believe this step should be followed by many similar steps according to some schedule. The schedule should be eventful, hopefully Syrian people, including me of course, won't wait a long time before the next move. We still have a lot to do, but finally we're on the right way. Guys, I think you have done pretty good job as a first timers. Here in the USA demonstration usually starts with 10 people and grows by time. In our State there are 180 counties not to mention cities, and it is really hard to reach people from all walks of lives. USA is a big country and people are productive and have little time on their hands. Weekends are for shopping and restacking, and travel from LA to DC will takes 2 days. However, thank you guys for your efforts and I wish I could travel to join you. I believe that yesterday's demonstration showed lack of organizing, and I think that more people would have come if they'd heard about the protest before. So we need to move on to more effective strategies. For example, it might be a good idea to establish an independent newspaper, and to publish it all over the countries that hold Syrian immigrants, (ie, all over the world). Another thing that could be done is searching for Syrian addrsses and locations in the U.S. for example, and send them periodic reports and invitations to some Syrian meeting. There's a lot to do, but there's nothing impossible. Thanks for your support, ya all, and indeed Free Man, this thing could and should have been more organized. But, we were really caught by surprise, I have to admit, we thought we had mor time ahead of us. Personally I have been more focused on the situation on the ground in Syria, it was my colleague from New Jersey, Fehmi Khairallah, who organized the event and prepared the banners and the slogan. I played a supporting role mostly. Anyway, enough excuses, this was just the beginning. We will do a better job next time, and yes, there will be a next time, and a next time, and a next time, until we get what we want. I sent the embassy an email with my NO. My NO is loud and clear. I hope they will take notice and the ambassador will stop talking in our names like we are yes people. I hope everyone in USA and around the world will send their NO. Stop the farc. I know it wasn't a bad start, after all this is the first time I see a "no" written in the public, but still we need a schedule or a plan to work according to it. I'm longing for the next time to come, so please don't make Syrian people wait. I am so with you in spirit. I would have loved to support you on your rally day, met your family and tell those in the Syrian Embassy that thugs can not long rule a country in this day and age. You have a very big thing going for you and that is the internet. People all over the world will hear of your fledgling protest and it will grow. I have already read posts on MEMRI of your dissent as well as others. You and your family must grow with it Ammar. It is a huge burden you have taken on. God bless you is really all I can say. ISTIFTAA is closed and the result, a historic outcome to re-elect President Bashar Assad as the President of Syria for the next Seventy (70) more years. President Assad first came to Presidency, when then an ultra corrupt Baathist Vice President Abdul Halim Khaddam, changed the Syrian Constitution by lowering the age requirement for President. That was Khaddam only positive contribution to Syria and Syrians in his entire corrupt political Baathist career. Syrian Nationalist Party members voted entirely as block with a sound YES vote. Afterward, in discussion at the online forum, the unanimous vote was apparent because of lack of a better Nationalist alternative for President. It was very clear that no alternative to the Nationalist Credential of President Bashar Assad is running. Assad, was the natural choice for those that wants Syria free, Democratic and independent. Ties to, or seeking help from Zionist Jewish controlled Organized crime family was simply not acceptable to members. While traitors seeking evil Jews help the likes of Khaddam, Bayanooni, Ghadri and Hariri are languishing in anguish, getting high deception doses from the con-men in America. President Assad receives daily these conmen and cowwomen who bow down to his excellency. Obviously intelligence had to do with President Assad success. While others lacked it, his excellency have shined it. WILL DEFEND YOU AND SYRIA. I could not sleep last night. I wanted to know who won the presidential election in Syria. I just heard that the announcement of the results has been postponed until tomorrow. That can only mean one thing: it is a very very close election. The results of the Syrian elections are hours away. I don't know about you, but I am getting more anxious by the minute. This is probably the closest election that I have observed in my lifetime. I wonder how the candidates (or candidate) is holding up. Did you hear the story about a Syrian citizen who went to the Syrian embassy in Yemen and declared his intention to register his candidacy for the presidency? Upon hearing his request, a Syrian diplomat beat him up. Is that a true story? Somebody said it on an Arab satellite station, I am told. The posts of Syrian Elector blog does not show on Syplanet. Only your blog Ammarj show there. Will you please either try to add the blog to Syplanet or post update on your blog so it show on this Syrian aggregate sites. The referendum conclusion was great, your protest was great. The recording of rigging the election should be spread and let poor ignorant syrian know this writing and I hope the day where it is going to show on Syrian blog is not far. You are gaining on them... Why else would a shill for the Syrian Nationalist Party even give a second thought to broadcasting his propaganda on your blog? The last time I saw this scum I wrote a very angry reply... Now, it seems that they are so insecure that they need to come back with other equally rediculous arguments to get Bashir elected. It would be funny if it weren't so serious. Stand strong Ammar. You, your family and your co-patriots have my highest respect! BTW, what do you think of the recent military action in Lebannon regarding the Palestinian camps and Al Queda? Someone made a comment somewhere that to have "refugee camps" for 50+ years is a disgrace. I think in the western world we don't even think about the word "camps"and what it implies, which I think implies a population that the host nation refuses to integrate (or maybe the refugees refuse to integrate). I sure would like to hear your thoughts on the matter. Also, what do you think about the Hariri investigation? Almost seems like a miracle to me that the UNSC is now willing to investigate this... Do you think it has anything to do with the elections or the recent military action in Lebanon? What do you think will happen in Lebannon? Really like the feel and appearance of the new site bud. Ammar, I'm an old friend and a neighbor of yours. e-mail me back and I'll let you know who. i hope one day you well be able to feel safe and welcome in your homeland..